Book Summary: DARTH VADER intends for the Empire to hold no secrets for him — or from him. Which means it is time to dig into the pet project of GOVERNOR WILHUFF TARKIN and ORSON KRENNIC: the massive battle station being built on GEONOSIS. Opportunity arises when the project is hindered by sabotage from unknown forces. THE EMPEROR calls on his dark enforcer to root out the source of treachery that threatens to destabilize the Empire’s galactic ascent. Book Review: This issue ties inbetween the book Catalyst and the Rogue One Storyline. Here we find see a bit more of the relationship between Vader and that of Tarkin. There was time when these two were battling for the favor the Emperor. Now there seems to be a mutual bit of respect forming between the two. However, in this issue, we see a bit of a small change in that sort of relationship because as we find Tarkin arriving on Scarif, he also learns Vader is there and possibly snooping around for information upon Project Stardust. Tarkin is less than happy with this and demands that Vader stand down. And Vader being Vader, well, you know that he doesn't take orders from almost anyone and tells Tarkin this. Of course, Tarkin is almost gleeful in his rebuttal and calls the Emperor to set things straight with Vader. In the end, the Emperor ends up being on Tarkin's side and this angers Vader to the point he envisions killing Tarkin. Upon the conclusion of their scenes, we are pulled into another scene. This time with Lyra Erso on Alpinn. She is there collecting Kyber Crystals for Galen. While she is working, an unidentified droid appears and gives her a warning: that those crystals she is collecting are for a super weapon....that countless of lives will be at stake if she continues her work...and what would her daughter think if she knew that her parents knew? Before Lyra can even ask about the droid's owner, the thing unexpectedly self-destructs. Without a second thought, Lyra runs off to give warning to Galen. So who was it that gave Lyra the warning? Many fans believe that it was Vader behind the warning because he was simply jealous of the Death Star. We never knew what his thoughts were completely on the thing in the trilogy because he was not the focus of the story itself. So getting a chance to see his way of thinking lets the reader believe this. Is it true? Or just wishful thinking on our part? I believe that Vader being the one behind the warning is a possibility. My thought is that Vader doesn't like anything that could make him irrevelant later on and the Death Star would do just that. So being jealous of this weapon would have caused him a brief moment of humanity relapse. Overall this was a great annual. I quite enjoyed seeing this side of Vader and I am looking forward to seeing more of him to come in the next issues. Book Summary: Two of the biggest titles in comics collide in the first crossover of the new Marvel age of STAR WARS! When Darth Vader accidentally finds himself facing off against the rebel fleet on his own, he is sent crashing onto a nearby planet. Will the rebels seize this opportunity to put an end to one of their greatest enemies — or will they be made to feel the full power of the dark side? The Sith Lord may be down, but he isn't out! All your favorites are here, old and new, good and evil: Luke! Vader! Leia! Aphra! Han! Threepio, Artoo, Triple-Zero and BT-1! And in a hair-raising battle of the Wookiees, Chewbacca versus Black Krrsantan! ROOOARRGH UR ROO! Book Review: In this series, Aphra has come across a location of Luke Skywalker and both she and Vader head to look for him. Unfortunately they also find the new Rebel Alliance base. Vader, of course, is never one to walk away from a dog fight even with the fate's stacked against him but this does go for him in a way. It brings Luke out in the fray as he engages Vader in the dog fight. This leads to both of their planes going down and the Rebel Alliance believing that all they need to do now is go down there and capture Vader. The thing is Vader is not so easy to capture and the Rebel Alliance is about to find this out. Aphra and her murderous droids set out to retrieve Vader. Add in Han, Leia, R2D2, and C-3PO and you have quite a bit of a mix to this story. This was another enjoyable set of comics. Vader shows you right off the bat why he is not so easy to capture and why he really is one of the most feared bad asses in the universe. He starts killing right away and there does not seem to be any stopping him in his quest to find the son he never knew he had. This part of the series was interesting and rather hard putting down until the very end. 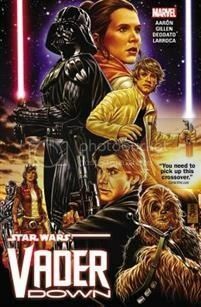 The writers did a very excellent job in keeping with the idea that this series stands between both episodes IV and V. There was a lot of tension that continued to build that would benefit episode V.
I would recommend this series to anyone especially a fan of Vader. It will keep you riveted from the moment you open the first page to the very last.